A provisional patent is cool. It lets you file your invention with the patent office for $125 without needing to do an exhaustive prior art search, or draft formal claims; just put your idea down on paper: You then can use the magic words “patent pending”, and you have established the date of your invention, and you have a year to file a full patent. Then in the body of the provisional patent, explain how your invention works by referencing each step in your figures, i.e. In Figure 1, we start by obtaining a big piece of wood (101), we then shape it into the form of a circle (102), drill a hole in the middle (103).. you get the idea. 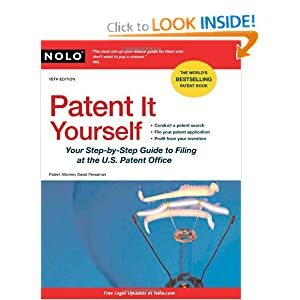 If you’re interested in this area – holler and I’ll get into more detail; but for those of you who are interested in learning more – check out Nolo’s “Patent it Yourself” book; it’s really good. However, for developers, a patent is incredibly interesting because it forces you to define the entire system very carefully; the patent essentially becomes your design document. But that’s not what this post was supposed to be about. Just because you invent something for a particular technology doesn’t mean you have to be an expert in that technology; I know about cloud stuff, and I know about programming things, but I’m not familliar with writing apps for mobile devices. So now, because I actually want to create the app to go with the patent, I need to figure this stuff out. A lot has changed in the last few years in terms of cross platform mobile development. Last time I looked, I had found Appcelerator Titanium which is an IDE that generates native application code… it’s not the easiest thing in the world to get going, but its cool. Now, my app isn’t rocket science… so I was looking for a simple way to create an app. Sencha Touch 2 is similar… but seems a little simpler to get going, and is supposed to be a little nicer on the UI side. Again free with paid support. If you think this Mobile enviornment is simple; take a look at the graphic below; those are the players what they do, and how they interrelate… courtesy of the next player… Kinvey. Tiggzi, which takes care of the front-end – and you can start for free. This combination is really powerful, and I suspect if I was brand new, just having a nice UI builder with a drag and drop interface would make me a believer. Here’s a helpful blog post from Maxa about using Tiggzi and Kinvey together. Finally, I found Trigger.io. And do I ever like it. It’s sort of retro (like me), meaning you still need to install the API’s for your platforms, but there’s something about their workflow that totally appeals to me. I’ve installed their toolkit and worked through their tutorials, I like how they’ve architected their solution; it’s different. Plus it provides native access to UI components so it should end up being both pretty and fast. I hope it doesn’t get vaporized when they get acquired… and I’m sure it won’t be long.